Milloth owes me dearly, Eruviel thought grimly. She had been fighting in Angmar three months ago, until Milloth had sent her to join the troop of Rangers in his stead. She did not mind men, but half of those in the company were young and fairly inexperienced. Commander Aloeer, a friend of many years, had kindly received her, keeping a watchful eye out for her as she worked with the few Rangers who lacked skill with a bow as well as a certain level of maturity. Leaning against a tree, her dark green hood having fallen half way off her head, she waited for the last of the men to finish bathing at the river. She had become painfully aware of the forty rangers that surrounded her, some letting her be, some ignoring her, and some studying her for whatever reason. It had been a hot summer and with the company making their way north the men poked fun at her for continuing to wear her heavier armour and cloak. A few of the older Rangers had met her before and they kept respectful relations, but a good number of the men had begun to throw names at her. They meant no harm, she was sure, in their ignorance of the Eldar as they discussed whether she had a body at all, or what she might be hiding from the world — as if their off-colored and derogatory references were supposed to get a reaction out of her. Unfortunately, her silence only seemed to encourage them. “Artis,” said a man walking past her. She looked up to see Cade, Aloeer’s second in command whom she had fought beside before. He had more of the look of a Southron to him, and several times Eruvial had heard him quiet the others when their joking had gone too far. “You’re up,” her jerked his head towards the river. “Aloeer made sure no one would lurk.” He offered a kind, yet slightly amused smile. Nodding curtly, she stood, returned the smile and made her way into the woods. The camp stood only a short distance from the river bank. Whatever enemy that might have been withing a league of the camp had been hunted down and killed. Thus they were granted the rare luxury of bathing in the clean, crystal river that flowed east from the elf havens in Lindon. “There you are,” said an older Ranger, pushing of off the tree he had been leaning on to approach her. “You need not wait for me, Aloeer. I do not need to bathe.” She glanced over her shoulder towards the camp. The man shook his head, giving her his best fatherly look. “I will wait here watching the camp till you have finished.” He walked back the tree, taking a towel from a branch and tossed it to her. Eruviel narrowed her eyes at him as she caught the rough cloth, a smile sneaking out one side of her mouth. “Thank you, Ada.” She hesitated for a moment before walking past the Ranger Commander into a small clearing, her eyes hungrily fixed on the shimmering river. Shedding her cloak, Eruviel unclasped her armour piece by piece, setting it aside. After a moment’s thought she hung her bow and quiver on the branch nearest the water and laid her belt with its daggers on the edge of the bank. Shifting her thin, white tunic around her she had just dipped one foot into the river when she heard Aloeer cough from his post. “What are you doing, my friend?” The man asked looking back at her. “Why are you looking, mellon?” Eruviel arched a brow at him. Eruviel frowned at him then looked down at herself as he turned away and crossed his arms over his chest. Why did she feel embarrassed? She looked back to the camp, then again to the river. A grin spread across her face as she walked back to the river’s bank, the blanket of pine needles cushioning each step. Reaching up she began to unlace her tunic, her bright green eyes surveying the land around her. Confident that there were none elsewhere she timidly let the garment fall to the ground, the only covering over her thin, toned body being strips of cloth wrapped around her chest, and a white loincloth-like undergarment that fastened around her hips. The river stretched wider at this spot, with round, smooth, multi-colored pebbles carpeting the riverbed. Summer water swirled around her feet, embracing her as she moved further in. Fifteen feet out the river finally rose to her waist, and a few steps further, the lazy current splashed up onto her face. Pushing off she dove under the surface, eyes open, light simmering through the crystal blue water. Evergreen forests blanketed the landscape, and she felt quite at home. She could see quite a ways both up and down stream, and Eruviel forgot her worries and stress, the dirt, sweat and sadness washing away. It had not been long, possibly twenty minutes of swimming and bathing when Eruviel suddenly felt ill at ease. Finding her footing she stood, chest deep near the far bank, her eyes narrowed — searching. The world seemed too still. Something flashed in the brush and before she could react a goblin lept out of the bushes at her, screeching at the top of its lungs. Falling atop of her she wrestled with the creature as they both plunged to the bottom of the river. Her hands held it’s wrists, it’s arms short enough that it’s gnashing teeth could not reach her. She dared not let go for a moment in attempt to snap the fiends neck, her eyes taking note of the goblin’s claws and the black dagger at its waist. Her lungs screaming for air, she kicked her feat along the river bottom in a desperate attempt to get to the other side. Bursting out of the water the goblin commenced its screaming, still thrashing violently. She could see her belt and weapons on the river bank not ten feet from her. The creature wrenched one arm free, and as Eruviel swung it around and over her head towards the shore the goblin’s claws grazed her right shoulder. 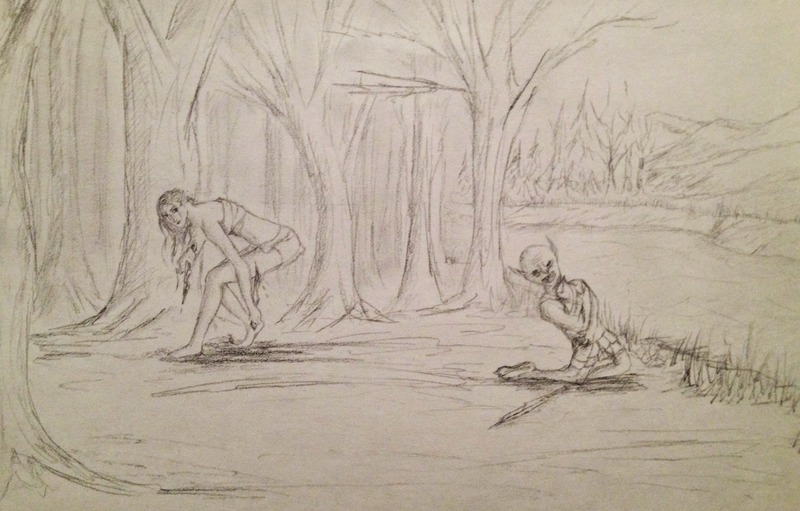 Not stopping, she sprung forward, sprinting through the water at the same time the goblin caught its footing and began to run back at her, it’s crude weapon drawn. Leaping out of the water, never stopping as she pulled her daggers free from their sheaths, the elf-maiden slashed out as she passed the goblin, skidding to a stop not five feet further. She rose upright to look back, flinging strands of wet hair out of her face. The goblin fell over dead, deep gashes in its neck and side. Smirking, she shook her head, flicking the black blood from her blades. “Disgusting creature,” she muttered as she checked the scratches on her shoulder. Her pale skin flushed from adrenaline, gleamed in the sunlight. Chuckling softly, glad that her few coverings had survived, she shifted her feet to walk back to the river when she stopped in her tracks. Looking up she saw all forty men stopped at the edge of the small clearing, swords drawn and jaws slack. How incredibly inconvenient, she thought as she surveyed the shocked, wide-eyed faces. Her mouth slowly turned up in a smile. She could do nothing now to cover herself so there would be no reason for her to scurry and hide like a child. Standing straighter with her arms down at her sides, she lifted her chin with an air of authority. “I presume, now, that all of your questions have been answered.” Her eyes openly assessed the Ranger’s faces. Aloeer leaned against his tree, his arms still crossed over his chest. His faced creased with an amused grin and a look of approval. Cade stood a step behind him, looking down as he sheathed his sword. She noted that he made a point to not look back up. ” I had hoped for privacy,” she said, her tone warm as most of the men suddenly realized that they were staring, looking away, their faces red with embarrassment. Aloeer turned towards the men. “You heard the lady. Get back to camp and make yourselves useful! She obviously needs none of your lousy protecting.” The men bowed their heads to Eruviel as they turned to leave, the younger ones more awkward, two of them retrieving the dead goblin and carrying it away. The few older Rangers gave her smiles similar to Aloeer’s. She could not resist letting out a quiet chuckle at seeing a handful of them hand Cade their coin pouches. Shaking her head with a smile as he walked away she glanced to Aloeer, giving him a knowing look. “I will be just a few more minutes.” His laugh echoed through the trees as he turned once more to face away. Throwing her daggers down to stick into the earth, she walked back into the river.